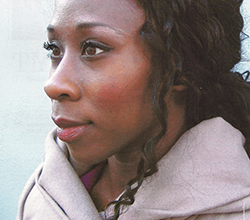 Esi Edugyan is a Canadian writer best known for her award-winning novel, Half-Blood Blues (2011). Edugyan’s parents came from Ghana, Africa, to Calgary, Alberta, where she was born in 1978. After completing high school in Calgary she studied creative writing at the University of Victoria and earned at B.A. in 1999. At Johns Hopkins University in Baltimore she earned an M.A. in 2001. She won several international fellowships: Klaustrid in Iceland, the Fine Arts Work Center in Provincetown, Hawthornden Castle in Scotland, and the Akademie Schloss Solitude in Germany. Edugyan’s first novel, The Second Life of Samuel Tyne (2004) portrays the life of a Ghanaian immigrant living in Calgary with his young family. When Samuel's Uncle Jacob dies he inherits a rural estate. Tyne convinces his wife Maud and his two daughters to move with him to the village of Aster, a small rural community founded by African-Americans in the early 1900s. There, he runs an electronics store and is at first happy to be his own boss in his new life. In time, however, he and his family become unhappy with the move to this small village after their life in a big city. About this time a series of mysterious fires occur, which makes everyone suspicious of their neighbours. It is best not to give away the ending. Aster is modeled after Amber Valley, an actual village founded by African-Americans in 1909 east of the town of Athabasca about 100 km north of Edmonton. Edugyan was inspired to write this novel by an historical photo from Amber Valley. While Edugyan was writer-in-residence in Stuttgart, Germany (2006-7) and at Schoeppingen (2010) she became interested in the lives of African-American jazz performers in France and Germany before and during the Second World War. Her research lead her to write, Half-Blood Blues (2011), a novel set in Nazi-occupied Paris. The narrator is Sidney Griffiths (Sid) the American member of a jazz band, who is witness to the arrest of his trumpet-player, Hiero, who is never seen again. The second part of the narrative continues in 1992 when Sid and Chip, another member of the original band, travel back to Berlin to see a documentary film about the jazz band and learn about the lost story of Hiero. Edugyan explores the dichotomy between the high cultural achievements of German music, art and philosophy and the dark side of war, racism and genocide. Travelling in Europe in my twenties, during my graduate work in Baltimore, throughout my childhood in Calgary, I would often be asked where I came from. “Canada,” I would reply, and then brace for the inevitable next question. “Yes—but where are you from really?” (11). In 2015-16 Esi Edugyan was writer-in-residence at Athabasca University, Edmonton.